We are bringing back the sales tax waiver for this month. 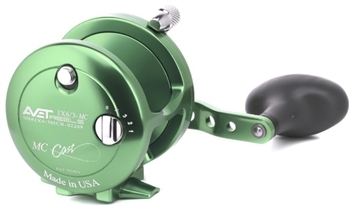 Buy ANY Avet reel this month and we will refund you the sales tax fee if you are in CA. There is nothing that you need to do, just place your order online and you will get the credit back! HX5/3 RAPTOR LEVER DRAG CASTING REEL Avet HXW 5/2 (2-Speed) Two Speed Model, Gear Ratio 5.4:1 High, 2.4:1 Low Lever Drag Control system New Cast Control system. 21lb strike with 27lb max drag. Line capacity 280yards of 50lb mono. SX - Comes with - Lever Drag control system, Preset Drag feature, Dry Drag for true water resistance, 100% precision machined aluminum, 8 Stainless Steel sealed ball bearings and components, Handle knob with oversized grip, & Proudly designed, machined and assembled in USA. The best thing to happen to your fishing reel since you took it out of the box! ReelX is the new, hi-tech, extreme-pressure reel lubricant lubricant that virtually eliminates wear, disrupts existing corrosion and prevents new corrosion or rust from forming. ReelX is perfect choice for all spinning and casting reels. As well as having plenty of room to protect your reels during travel or storage, these high quality padded nylon soft-sided cases feature plenty of roomy pockets for storing leaders, tools, manuals…anything you can stuff into them! They have movable padded dividers with hook and loop attachments in the main reel cargo area, heavy duty zippered pockets and a wide, comfortable adjustable shoulder strap with quick release buckles. Made from heavy-duty black nylon, they feature a beautifully detailed color embroidered Avet marlin logo on the front. Avet padded reel covers provide protection for your reels on or off of your rods. Features a unique hook and loop fastener for easy hassle free installation and removal and added wrap-around protection for the rod clamp Fits all SX Reels.